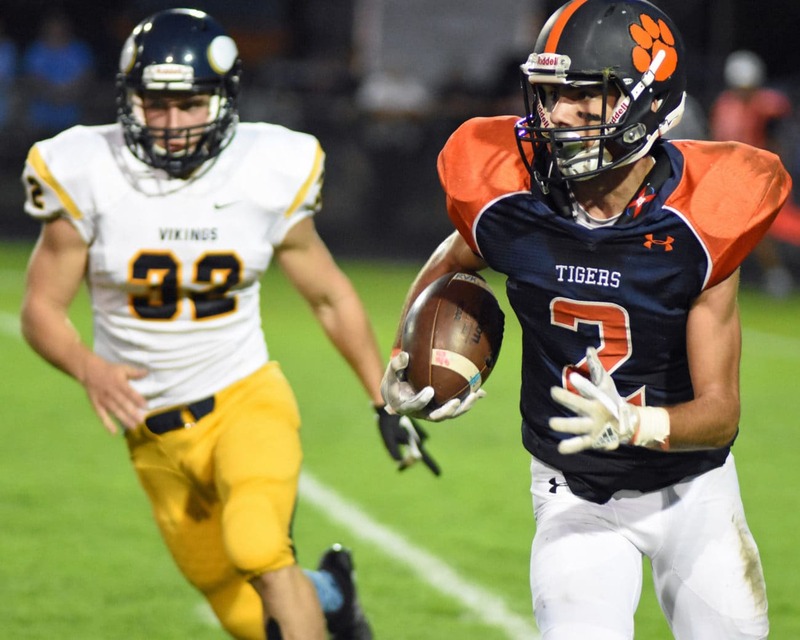 GALION — Unckrich Stadium in Heise Park was the scene for the clash between Mid-Ohio Athletic Conference foes, the hometown Galion Tigers and the visiting River Valley Vikings. On Veteran’s night, the crowd young and old were treated to a run-dominated, hard-nosed football game. River Valley at Galion in MOAC football action Friday, Sept. 22, 2017. Photo by Don Tudor. When the clock expired, it was the Tigers that would come away with the victory by a tally of 42-35. Galion improves to 4-1 at the halfway point in the 2017 season and now sits at 1-1 in MOAC play. With the defeat, River Valley drops to 2-3 overall and 0-2 within conference play. Galion won the coin toss and deferred to the second half, giving River Valley the ball to begin the contest. River Valley seized the opportunity and marched the ball down the field and scored on the opening drive. The Vikings converted the extra-point and took the early 7-0 lead. 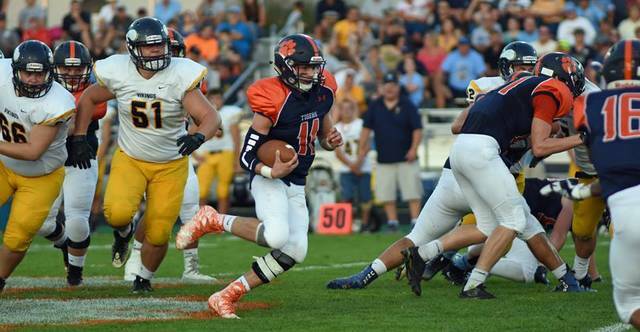 Galion would not hesitate to retaliate and would also drive the length of the field and score their first touchdown of the ballgame on a quarterback keeper from Harrison Ivy. Dominic Pittman would split the uprights on the PAT to tie the game at 7-7. The scoring was far from over in the first quarter though. River Valley would catch a break on their next scoring drive. Galion’s defense would cause a fumble but the Vikings would scoop it up and punch it in for their second score of the game. The extra-point was missed and the Vikings were out ahead; 13-7. Ivy decided to change that with another long drive and another three-yard touchdown run and Pittman PAT to give Galion the 14-13 advantage after 12 minutes. On their first two drives of the second quarter, River Valley would put some distance between themselves and the home team, converting two more touchdown runs, a PAT and a two-point conversion to put the visitors up; 28-14. Ivy would score his third rushing touchdown of the evening, this one from 14-yards out while Pittman added the PAT to put the Galion squad back within a score at 28-21 heading into halftime. Receving the opening kickoff of the second half turned out to be a smart decision by the Tigers. 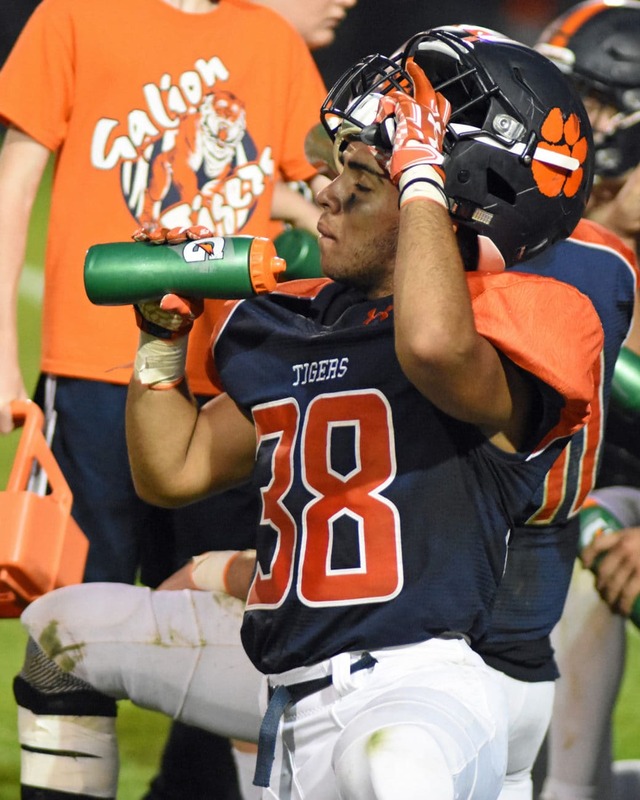 Galion’s first drive of the third quarter ended with the fourth rushing touchdown by Ivy, a 17-yarder and another Pittman PAT knotted the game up at 28 points apiece. River Valley answered back with fifth and final rushing touchdown of the night and a converted extra-point to go ahead; 35-28. With 8:40 remaining in the game, Ivy dropped back and connected with Isaiah Alsip for an 11-yard touchdown reception. Ivy wasn’t finished with that drive though and ran in the two-point conversion attempt to place the Tigers ahead; 36-35. River Valley could not getting the ball moving enough in the fourth to answer and Galion would add another score to take the lead with 2:25 remaining. This score came on an eight-yard run by Tanner Crisman. Galion attempted the two-point conversion but were stopped short. With a 42-35 lead in tact, the Tigers’ Pittman executed a perfect onside kick, recovered by the home team. Ivy and the offense would move the chains enough that they could take the victory formation and kneel out the remainder of the game to seal the win. 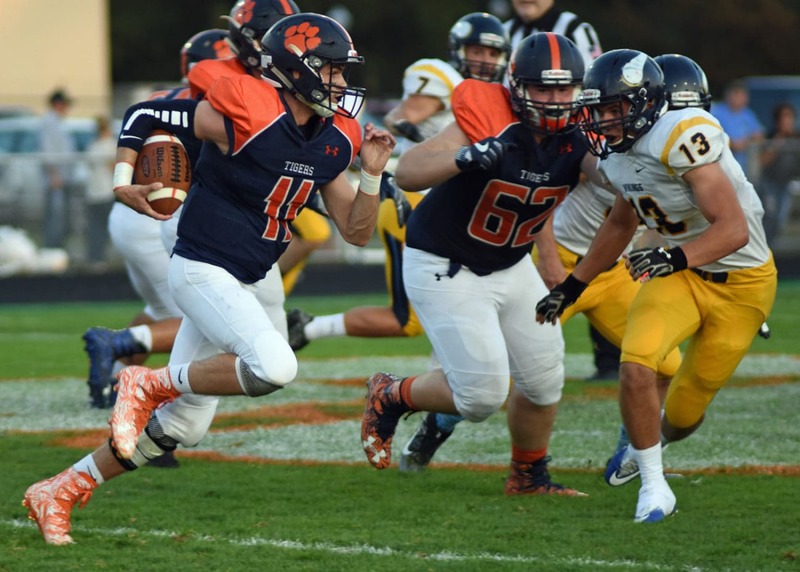 Don Tudor | Galion Inquirer Galion quarterback Harrison Ivy ran for four touchdowns and threw for another in Friday night’s win against River Valley. The Tigers won 42-35 to improve to 4-1 at the halfway point of the season. 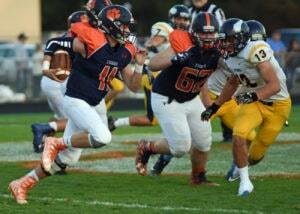 https://www.galioninquirer.com/wp-content/uploads/sites/38/2017/09/web1_Harrison-Ivy.jpgDon Tudor | Galion Inquirer Galion quarterback Harrison Ivy ran for four touchdowns and threw for another in Friday night’s win against River Valley. The Tigers won 42-35 to improve to 4-1 at the halfway point of the season.